Dare to venture into the heart of Yemen and you will find yourself swept up in the mystery and mystique of Sanaa, a city of ancient walls and astonishing stories. Sanaa (or Sana'a) is the capital of Yemen and home to over 4 million people. Popular attractions include the Old City of Sanaa, Souk al-Milh, and Dar al-Hajar. Get ready for the trip of a lifetime with cheap flights to Sanaa. Sanaa is home to Sanaa International Airport (SAH), which is a 30-minute drive from the city centre. Due to the conflict in Yemen, all flights to the country have been suspended. The distinctive architecture of Sanaa is perhaps one of the most interesting and endearing things about the city. Adorned with geometric patterns, the labyrinthine city is a true architectural wonderland. 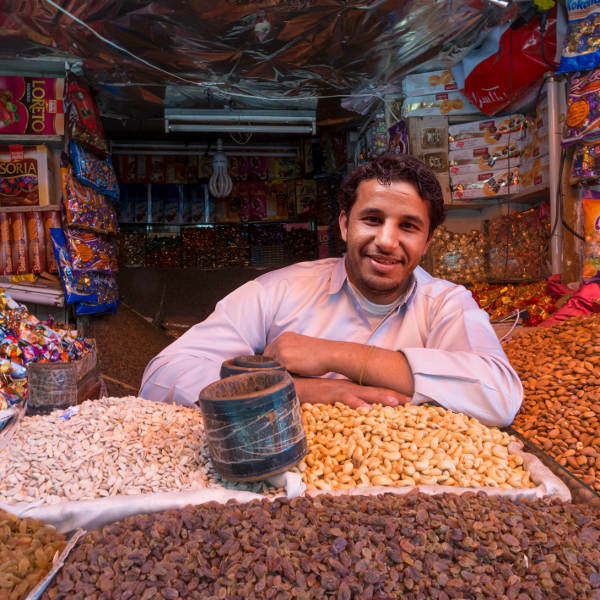 The energy of Middle Eastern markets is chaotic and utterly irresistible. Get lost in Souk al-Milh where Arabian daggers glitter on the walls and exotic scents swirl through the air. Dining in the desert has never tasted so good. 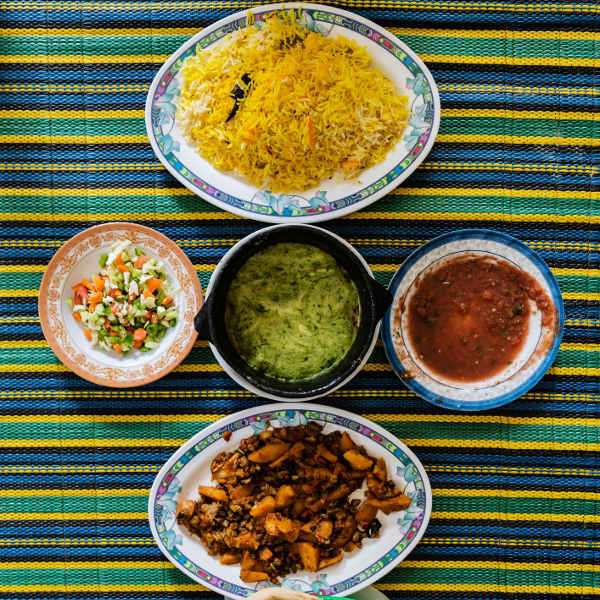 Spices and ancient traditions are a big part of Yemeni food. Be sure to try popular dishes such as shafoot, saltah, hanith, and bint al sahn. 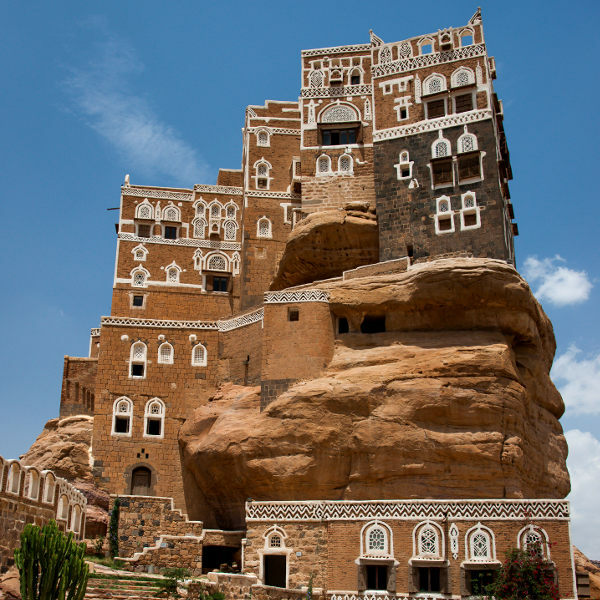 Sanaa has a desert climate with warm temperatures and very little rainfall throughout the year. The “rainy” seasons are from March to April and from August to September. The best time to visit Sanaa is after these rainy seasons. Sanaa is not an easy city to get to, and not an easy city to forget. Sprawled across a mountain valley, it is a city molded out of ancient clay and adorned with chalk patterns that seem to hold the secrets of ancient empires and secret worlds. Follow the scent of coffee and cumin through the streets of the Old City and you will understand why the souks and markets of the Middle East are a feast for the senses. If you are lucky enough to befriend one of the locals you might find yourself invited into their home for khat and tea. The people of Yemen are famous for their friendliness and warm hospitality, so chatting to them and sharing stories is undoubtedly one of the best experiences you can have in Sanaa. It is also the best way to learn about the unique culture of the country. Penetrate the walls of this ancient city and you will find yourself in a dream world where time seems to stop and the sun seems to burn a little brighter. Compare several airlines and book your cheap flights to Sanaa online at Travelstart! Travel to Yemen is generally discouraged because of the unstable political situation and civil war that has gripped the country since 2015. And although it is possible to travel to Sanaa and have a fantastic trip, it is important that you are aware of the risks involved. You should also do some research beforehand and take certain precautions during your trip. Stay away from protests and demonstrations. Find out which parts of the city should be avoided and steer clear of them. Dress appropriately. Ensure you have the necessary travel permits. Travel with a licensed driver and guide from a reputable local company. Obtaining travel insurance is also highly recommended. It is also essential that you familiarise yourself with the local laws and customs before you arrive in Yemen. You will need vaccinations for cholera, hepatitis A & B, typhoid, and rabies. You should also be up to date with routine vaccinations for MMR, diphtheria-tetanus-pertussis, meningitis, varicella, shingles, pneumonia, polio and influenza. Malaria is also prevalent in Yemen, so prescription medication to prevent malaria is recommended.